HDHomeRun on Kodi the easy way. Automatically finds all the compatible HDHomeRun devices on your network, collects available channels, and starts showing TV. Pressing select or right brings up the episode guide, where you can see what's on, and what's coming next. Pressing back brings up DVR and Options. DVR provides a simple intuitive interface to record and watch your favorite shows when you want to. 6.1 Do I need to provide EPG data? 6.2 Can the add-on record video? 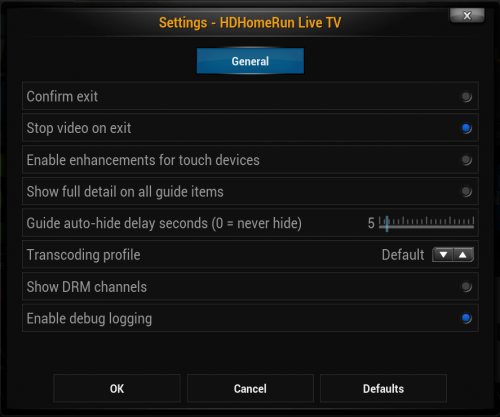 HDHomeRun is made by SiliconDust and is a stand-alone networked TV/HDTV tuner box. The HDHomeRun can either connect with over the air TV signals or with cablecard, and then stream the channels over a network to supported clients, such as Kodi. Note: Be sure to install the latest firmware for your HDHomeRun unit to enable all of the features of the add-on. Show guide - Select button or move right →. Show options and Search - Context menu Menu or move right → when the guide is visible. Channel changing - Using up/down arrow keys and enter/select will allow the user to select which channel they want and then go to that channel. Direct channel input - If using a remote with a keyboard, numbers + enter/select will allow the user to go directly to that channel number. For example, 1+2+3+↵ Enter will go to channel 123. For sub-channels, insert a period . Note: There is now experimental support for channel up/down keys, but this has not been fully tested yet. Show guide - tap screen or swipe left. Show options and Search - Swipe left when guide is visible. Exit - Because this add-on doesn't include the traditional GUI, when using with a tablet, exiting the add-on requires a two-finger swipe to the left. Show guide - Enter or right →. Show options - C key or right → when guide is visible. Direct channel input - Numbers + enter/select will allow the user to go directly to that channel number. For example, 1+2+3+↵ Enter will go to channel 123. For sub-channels, insert a period . highlighting the add-on in Kodi -> bringing up the context menu (MENU on a remote and C on a keyboard) -> and selecting Add-on settings. Be sure to select Okay when you are done changing settings in order to save those changes. Disables the prompt asking if you really want to edit when escaping/existing out of the add-on. Prevents the current channel from continuing playback after existing the add-on. Currently allows 'flinging' of the guide when swiping up and down by using a different display method. Uses more CPU when enabled. Shows full information on all channels when the guide is visible, such as summary, rather than only showing the details for the currently selected channel. Allows you to hide the channel info and guide when the guide is manually displayed by pressing select or left. Selects what transcoding profile to use for the video feeds. Shows channels in the guide that Kodi cannot play due to restrictions imposed by your cable provider. Enables extra data that is saved to Kodi's debug log. This is used for troubleshooting and bug reporting for the add-on. Nope. SiliconDust pays for providing the EPG (electronic programming guide), channel icons, and other data from FYI Television. This data is downloaded directly onto your HDHomeRun unit and the add-on loads that data from there. Currently, no. The add-on is just for viewing live TV. This page was last edited on 3 March 2019, at 02:13.